American actor and producer George Clooney had landed in a hospital in Italy after a frightening scooter accident in Sardinia less than a week back. But now it seems like the 57 year old actor has recovered fast and was seen walking unassisted as he arrived in Rome through an airplane on July 15, 2018. Clooney was involved in a scary head-on collision on July 10, 2018 while he was travelling at the speed of 60 mph on the Italian Island of Sardinia with a Mercedes. A video footage of the incident showed Clooney’s scooter crashing in to the car and a figure that appeared to be Clooney was thrown in front of his bike in to the air before he landed on the street. The car driver and other witnesses soon came to his assistance. The director was soon taken to the hospital but his injuries were not so serious and was discharged. More reports said that Clooney’s helmet had hit the windshield so hard that it broke due to the impact. Clooney’s representative, Stan Rosenfield while talking to a leading daily said, “George was treated and released from an Olbia hospital. He is recovering at home and will be fine.” The Oscar winning star was snapped flashing a smile as he arrived in Rome and walked unassisted and also carried his backpack. George was clearly in pain but seemed in high spirits as he walked through a small airport in Rome. 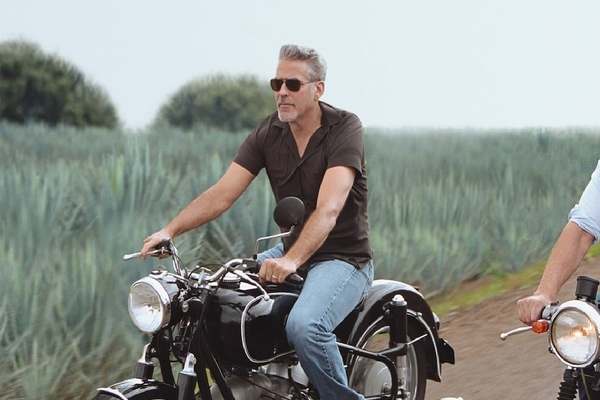 George Clooney is currently filming for his new Hulu series, Catch-22. The sight was seen just three days after the actor was seen getting on a private plane with his wife Amal Clooney and their twins. The actor had then required the help of the flight crew as he dragged himself in to the aircraft. Clooney is surely getting better every day despite going through a rough road accident.